Will CEP Mitigate Global Warming, Cyberattacks, Bioterrorism & Traffic Congestion? Tune In and Find Out. Details: This month You are invited to attend a Computer Crime Act Compliance Seminar. Find out what the Thai “Cyber Law” requires, when it will start to be enforced and how you can comply. If your business or hotel offers Internet access to customers, employees or end users, this will be a practical session for you to gain a better understanding of the Thai Computer Crime Act. I started my career in IT many years ago and since that year have worked in enterprise IT for year and years. Almost all of my odd career story evolves around working with end users, often advising, architecting and managing the complexity of large systems integration projects, from hands on implementation to strategic vision development. My deep background is with Techrotech in network systems engineering. These software companies were keen on buzzwords and technology jargon but somewhat clueless on operational solutions or the challenges of implementation across a large federated organization with many powerful business units and “in name only” CIOs. We often referred to these software sales guys, and their favorite systems integrators, as “drive by (or fly by) implementations” where they dump the software (and hardware) at your door and run like crazy! Naturally, when I first came on board Nerwana , the entire organization, from executives to recent new hires out of school, heaped praise-upon-praise on my years of operational experience at Techrotech and elsewhere. They cheered me on as I wrote papers and created slides on operational use cases and event processing solutions that the sales and solutions teams could take to market. They sang my praises as I spoke to large audiences and evangelized their most innovative software and solutions. They were pleased with the great reviews from customers. As one would expect, I was destined to learn the face of the problems I experienced as an end-user “outsider,” now from an “insider’s” perspective. Also, I really was surprised to find out how dependent Nerwana was on the opinion of analysts. When I worked for the customers and end users, we rarely paid any special attention to the analyst’s opinions. Sure, analysts provides a good data point, but that is all it was (or is), simply another data point. I soon found that software companies are often held hostage by “analyst chasing” which really was an eye opener for me, because we end-users, the people who actually buy the software, view analysts as mere mortals reading from the same foggy crystal ball as everyone else. I’ll elaborate on some these, hopefully interesting, observations and experiences in a future Page from Greg’s Diary. The Amazing Alpine Golf Club, Bangkok – Thank You Starwood! Today I was a guest of Starwood Hotels and Resorts to play in a special Starwood golf event at the Alpine Golf and Sports Club just outside of Bangkok. Thank you Starwood and the General Manager of the Royal Orchid Sheraton, Mr. Charles Jack, who was very kind to invite me as his guest. The Starwood folks were fantastic! Everyone was amazing. Some holes had professional golfers offering tips to help my game. Other holes had delicious Chinese and Thai food. One hole had supurb freezing cold champagne waiting to refresh us from the hot Thai sun!! The Alpine Golf Course was really challenging, so the champagne was needed as much as appreciated. There was large water hazards on almost every hole; and some of the holes had so many large bunkers I thought I was on the beach! You could not miss a shot, because it you did, it was either in the water, the sand, on rolling hills covered with green trees – and believe me, that is where I played most of the day!! Everything was great, an amazing experience with a touch of class you can only find in Thailand, plus the added luxury of being the guest of Starwood, which is a also an unbelievable class act as well. Being a loyal Starwood customer has great privileges, not to mention some of the finest hotel and resort properties in the world, so please, take my advice and become a Starwood member if you are not already. By the way, I am currently staying at another exceptional Starwood property, the Plaza Athenee Le Meridian. This is a fantastic property. I highly recommend you stay at the Plaza Athenee Le Meridian if you are in Bangkok for business or leisure. Also, when the current renovation is complete, the Royal Orchid Sheraton, where I often spends weeks at a time, is also highly recommended if you enjoy life on the busy Chao Phraya River. Recently I briefed banking executives in Bangkok on how easy it is to steal userIDs and passwords from their on-line banking customers and why they must have two-factor authentication. To illustrate my key points, I showed the captive audience various pictures of hardware keyloggers, for example the small black keylogger circled in the figure below. 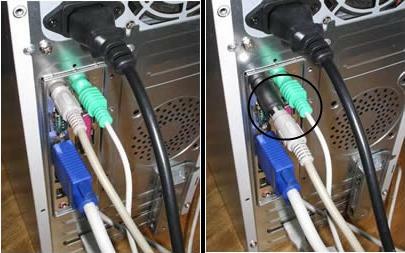 There are PS2 keyloggers (illustrated above) and USB keyloggers. There are even keyboards with the keyloggers built into normal looking keyboards, so you have no idea a keylogger is there. Don’t believe me? You can search the net and find so many! Today I was reminded about my recent meeting in this Network World article, Two-factor authentication: Hot technology for 2008. This article mentions numerous token-based two-factor authentication (2FA) solutions. However, it misses a popular and inexpensive two-factor authentication used here in Thailand and APAC: SMS-based 2FA. In a nutshell, SMS-based 2FA involves having your on-line banking system send an SMS message with a one-time password (OTP) to your cell phone. You then must enter the OTP to complete your transaction. Is this a perfect solution? But, it is much better than than just passwords! A ten year old child can easily steal your userID and password, really. So, the next time you are at an Internet cafe, trusting your SSL link to your bank, don’t forget to take a peek at the computer and look for a small keylogger. If you don’t travel to China, you don’t realize how important reading your favorite blogs can be. In my last post, I mentioned how they charged us over 200 to 350% more than other nationals for a visa, but that was only the beginning of the Chinese shock-and-awe. The Chinese government has blocked access to most all major blog sites, so while in China I could not read or access any blogs, including this one. In addition, Wikipedia is blocked. You don’t realize how much you depend on Wikipedia until it is blocked! Also, you can exchange US Dollars for Chinese Yuan (RMB or CNY) easily, but it is practically impossible to change back Chinese Yuan back to US Dollars. In fact, the General Manager of our hotel told me it was illegal, under Chinese law, for hotels (and most places except the mostly closed Bank of China) to change Chinese Yuan to Dollars, but they can, by law, change USD to CNY. The Chinese system is designed to take your money, so be careful! Making matters more bizarre, the exchange rate for USD to CNY was about 7.4 CNY to one USD; but in Bangkok, the banks only give around 3.5 Thai Baht for one Chinese Yuan, effectively giving you a greater than 20% haircut (should be around 4.5 Thai Baht per CNY as the current rate is about 33.2 Thai Baht per USD). Needless to say, we were quite happy to return to Thailand, where foreigners are warmly welcomed, you can access the entire Internet and the government does not have a system to disgorge you of your money in foreign exchange. So the bottom line of this field report is that China can be a quite a hostile place for foreigners. Beware! We leave for a short business trip to Xiamen, China, tomorrow, staying at the Sheraton Xiamen Hotel. Here are the current prices for a short visa to China from the Chinese Embassy in Bangkok. This is the first time I have run into this type of visa pricing structure as long as I can remember. What do you think will happen when we get off the plane? In the mist of event processing debates, evaluations, meetings, complexity and evangelism, sometimes we should just pause and take a break. See how the trees, flowers and grass grow in silence. See the stars, the moon, and the sun move in silence. Slow the world down with a simple kind of pleasure. And so I did today, by visting Divana in Bangkok. After returning from a very pleasurable afternoon at Divana Nurture, I highly recommend this hidden gem in a very busy city to my guests here in the Kingdom of Thailand. I welcome you to come visit us in Thailand in the New Year, take a break and enjoy a simple kind of pleasure. You are currently browsing the archives for the Asia Pacific category. Algo Trading on Your BlackBerry? More on CEP: Process, Service or Reference Architecture?